Can I Get a Plug-In Hybrid Now? Fill up your 21-mile-per-gallon gasoline vehicle with $2.11-per-gallon gasoline, and you are paying more than 10 cents per mile for fuel. Charge a 2.9-miles-per-kilowatt-hour electric vehicle with 8.7-cents-per-kilowatt-hour electricity (U.S. national averages), and you are paying only about 3 cents per mile. With dependence on foreign oil clearly our most pressing energy (and perhaps international relations) problem, it seems like a natural shift to move toward an electric-vehicle-based society at one-third the cost. We have already started that shift, with recent heightened interest in hybrid-electric vehicles. But the road ahead to more energy independent vehicles is still a long one. In Toyota City, Japan, 300 users share 50 Toyota Crayon neighborhood electric vehicles, which use a sophisticated communications and control system to commute between their workplaces and train stations. The system includes wireless tracking of the vehicles, keyless access and Web-based car reservations. The project is exploring how to make car sharing more convenient and usable. Courtesy of Toyota. Hybrid-electric vehicles, which are rapidly gaining popularity with both consumers and manufacturers, help improve efficiency over conventional vehicles and avoid the concern for limited range that has dogged electric vehicles. Yet they dont offer the chance to operate on less expensive electrical power. Thats where plug-in hybrid-electric vehicles come into play: They add larger battery capacity and an electric plug for recharging for all-electric operation. And going even one step further, vehicle-to-grid plug-in hybrid-electric vehicles make the energy exchange a two-way process, making each car part of the power grid. Such a two-way plug allows the home and vehicle owner and the local utility to take advantage of the extra electrical storage capacity in the vehicles battery to meet peak demand, provide grid support services or respond to power outages. This technology could be available soon  its just a matter of cost, consumer demand and leadership by manufacturers. The technology offers lower fuel costs, home refueling convenience (and fewer trips to the gas station) and reduced tailpipe emissions. It could make our cities cleaner and quieter, while making electricity service more reliable  and it could make a meaningful difference in curbing petroleum consumption. Demand in the United States far outstrips our domestic petroleum supply, leaving the country vulnerable to high petroleum costs and disruptions for imported oil. The transportation sector consumes two-thirds of U.S. oil, with highway transportation alone consuming more than half. And transportation oil use has a large effect on local environments and global climate change. The transportation sector is the fastest growing source of emissions in the world. To make matters worse, U.S. oil imports, projected to rise to 70 percent of consumption by 2025, are the single largest component of the U.S. trade deficit. So why not combat the problem by switching to a domestic, cheaper and more efficient energy source for transportation? Most fuel alternatives to gasoline and diesel are still derived either from petroleum and natural gas, which are becoming increasingly scarce and expensive. The only current renewable alternative fuels are ethanol and biodiesel, made in the United States mostly from corn kernels and soybeans, respectively. Biodiesel use is growing rapidly, but is still very small. Ethanol made from corn or other grains and biodiesel fuels made from soybeans or other oil seeds are expensive (see story, this issue). More critically, they are only available in quantities sufficient for additive use. Ethanol is blended into more than 30 percent of U.S. gasoline, but still totals only about 2 percent of total gasoline sales. Making ethanol from cellulose (the fibrous bulk of most plant matter) and improving conversion technologies could greatly expand the potential supply  promising to significantly help displace U.S. gasoline demand in the future. However, the ability to replace gasoline with renewable liquid-transportation fuels is presently limited. Another option  hydrogen  might burn cleanly in fuel cells, but will be made from natural gas for the foreseeable future, or eventually may use the biomass that would go into making ethanol. We need these alternatives  and improved fuel economy  but we also need more diversity in our energy portfolio to slow and then reverse this growing trend in petroleum use. 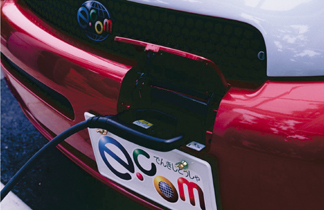 All these reasons have led to considerable interest in electric vehicles for awhile. Even Henry Ford and Thomas Edison had electric vehicles at the turn of the last century. Interest rekindled in the 1990s, as manufacturers were mostly responding to regulations, but consumers were put off by the limited range between charges. Now, though, consumers and manufacturers seem to have gotten on the bandwagon for hybrid-electric vehicles that combine an electric motor with an internal combustion engine. With higher fuel efficiency, longer ranges between ordinary gas station fill-ups, and clean and quiet operation in city traffic, the hybrids seem to have the best of both worlds  but perhaps additional refinements can make them even better. Enter plug-in hybrids. One of many potential pathways being researched today, these vehicles can yield even more oil savings and emission reductions than regular hybrids in the near term and can pave the way to the much discussed hydrogen-powered fuel-cell vehicles of the future. A couple of prototype plug-in hybrid vehicles have already been manufactured or converted from hybrid vehicles by entrepreneurial engineers. Prominent among plug-in hybrid projects is the Mercedes-Benz Sprinter van being developed by DaimlerChrysler with partial sponsorship by the Electric Power Research Institute (see sidebar, below). Anticipated benefits of the plug-in hybrid Sprinter include up to 50 percent fuel economy improvement and a 20- to 30-mile all-electric range. Improved electric drive, power electronics, computer control and batteries that are making hybrids mainstream also enable easy adoption of plug-in hybrids. But plug-in hybrids differ from current hybrids in two ways. First, the typical small battery pack in a hybrid vehicle sold today is replaced with a larger battery, perhaps supporting 20 to 60 electrified miles per charge (depending on the battery size). Second, the vehicle can be plugged into a standard low-voltage home, office or garage outlet to charge the battery without the engine running. Fifty percent of all U.S. vehicles travel less than 20 miles per day. Because plug-in hybrids can travel this distance primarily using electric power, they can run quietly, cleanly and cheaply for much of a typical days driving. Like current hybrid vehicles, when the charge is used up or when the vehicle exceeds battery capacity, it automatically switches to run on the vehicles conventional fuel engine. The vehicles have on-board controls to prevent their batteries from being drawn outside their charge limitations, to protect battery life. The extra battery capacity for plug-in hybrids adds weight, takes up space and is not cheap, probably on the order of $1,000 for every 10 miles of capacity. But, at 7-cents-per-mile savings, those 10 miles of extra battery capacity are worth about $250 per year, repaying the extra cost in less than four years. Fuel savings may, however, only be the beginning of payback for the battery capacity of plug-in hybrids. The vehicle-to-grid hybrids battery stores extra electricity for the home. Image courtesy of the Earth Science World ImageBank. The plug-in hybrid can also send power back to the grid, so that an electric utility can draw on the vehicles battery to support the grid, or during peak demand periods or power outages. This capability with the plug-in hybrid is commonly referred to as vehicle-to-grid (V2G). Utilities might compensate V2G car owners to borrow energy storage capacity, thereby pre-paying for the extra battery capacity. In addition to this compensation for grid support services, the vehicle owner could benefit from differential rates for off-peak charging and peak contribution. Why is this distributed storage capacity worth so much? 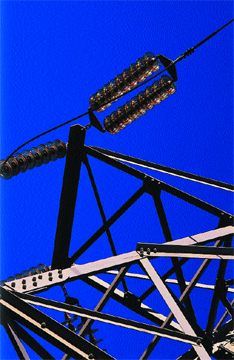 Utilities supply various types of electricity. Base-load power generators have high capital costs and low operating costs, so they produce electricity at a relatively low per-unit cost when running at a high capacity factor. Plants with lower capital costs designed to meet peak loads have higher operating costs, so they are only run during the highest demand periods. Because demand is not completely predictable, utilities must also have some units that can quickly respond to unexpected changes in demand. Grid support or ancillary services point to this quick-response capability, which has been estimated to cost $12 billion per year in the United States, 5 to 10 percent of total electricity costs. If V2G hybrids can give and receive electricity to and from the grid on demand, they could help reduce the cost of ancillary services and peak power, while increasing the grids stability and reliability. Electrical generation is only about 30 to 60 percent efficient, depending on the age and type of generating plant, but conventional transportation is far worse. The average cars internal combustion engine is able to make use of only an abysmal 13 percent of its gasoline energy for propulsion. So, with roughly 80 to 90 percent efficiency from its electric motor, a V2G hybrid using even relatively inefficient electrical generation can be far more efficient than a conventional vehicle. Make the electrical generation system more efficient  as is likely  and the V2G system becomes even more efficient. In addition to energy savings, compared to a traditional hybrid or conventional vehicle, a V2G hybrid runs more on the electric motor than the gasoline engine, making these two-way plug-in cars cleaner and quieter. The reduced toxic tailpipe emissions will be offset to some extent by increased emissions from the utilitys main grid generation facilities. Calculating that tradeoff is highly complex, but California and other states zero-emissions vehicle programs certainly attest to expectations that electric vehicle operation is better for air quality. A recent California report on reducing greenhouse gas emissions finds that on a life-cycle basis, using electric vehicles emits only one-third as much greenhouse gas as using gasoline-powered vehicles. Emissions from central generating plants are certainly easier to control than from individual vehicles. The really big potential future improvement from using electric charging to power V2G hybrids, however, will come from integrating the technology with renewable energy and thereby reducing all potentially harmful emissions. Near-zero or zero-energy homes use geothermal heat pumps or other efficient heating and cooling systems. Energy-efficient construction and appliances dramatically reduce the homes need for power. And rooftop photovoltaic (solar panel) systems supply most of the small amount of power the house does need. Excess photovoltaic generation is used to charge the homeowners V2G hybrid or is sold to the grid. To add value, the V2G hybrids battery stores extra electricity for the home. And the local utility, which is providing necessary grid power, generates as much energy as possible with wind and other renewable energy. It also takes advantage of the V2G vehicles energy storage to level supply and demand. And, what little fuel V2G cars need will be renewable, such as ethanol or biodiesel in the near-term, or hydrogen for the vehicles fuel cell in the long-term. Sound like a pipe dream? It isnt. The technology is available right now and can be economically viable. Experts at the National Renewable Energy Laboratory and others are studying V2G hybrids and their benefits, and are looking at integrating all the pieces, as well as part of a larger systems solution called the renewable community. Wind energy is already very close to being cost-competitive with main-grid electrical generation. Only modest subsidy increases or other policy changes would be needed to make it fully competitive. Geothermal, waste-to-energy and other biomass power, and hydroelectric generation can also make contributions. Photovoltaic systems are still expensive for main-grid generation, but are nonetheless becoming quite popular for home and business installation. If considered as part of a homes value  particularly if installed with original construction so they can be included in the mortgage  photovoltaic systems can be worth the extra cost. And using a combination of rooftop photovoltaics and V2G vehicles, home and business owners can do some of their own peak management and reduce reliance on their utility for back-up. As for the V2G plug-in hybrids themselves, future battery improvements will make them increasingly economical, but as CalCars (see sidebar, below) and other after-market conversions have shown, no rocket science is needed; they are technically feasible right now. The lower operating costs, environmental benefits and operation convenience of V2G cars make them winners for consumers and car companies throughout the world. The time is now and the opportunity is here to help get America off its ever-increasing dependence on foreign oil and all its associated problems. Want domestic empowerment? Just plug it in. Not quite yet, but it might not be that long. CalCars, a nonprofit advocacy group for plug-in hybrids, has demonstrated the relative simplicity of the technology by modifying a Toyota Prius hybrid by adding ordinary lead-acid batteries. Southern California commercial company Edrive Systems LLC is aiming to have conversion kits using lithium-ion batteries available for the Prius for $10,000 to $12,000 by next year. (Hondas hybrids use a different configuration in which the gasoline engine always runs, so it could not be so easily converted.) CalCars estimates that as original equipment, plug-ins could be made for $2,000 to $3,000 more than a regular hybrid. The Mercedes-Benz Sprinter is a diesel-electric-hybrid delivery van with 14 kilowatt-hours of nickel-metal-hydride battery capacity. Its parallel configuration automatically selects between the engine and the motor for normal operation, using both when needed for acceleration, but can select for all-electric drive of up to 30 kilometers (19 miles) of emission-free driving in urban areas. The vehicles will be tested in electric power company fleets in Europe and the United States in this year. Penney is technology manager of FreedomCAR and Vehicle Technologies for the National Renewable Energy Laboratory (NREL) in Golden, Colo. Elling is a senior communicator working on advancing transportation technologies at NREL.